Nationwide, paper and cardboard account for about 41% of all municipal waste. That is close to half of all the garbage generated in the U.S. Paper can be easily recycled, yet the United States recycles only about 25% of the paper it consumes annually. According to AFPA, in 2017, about 36% of the paper recovered in the U.S. is used to produce container board, the material used for corrugated boxes, and about 12% was used for boxboard that includes base stock for folding boxes and gypsum wallboard facings. When most people think of junk disposal, they think of landfills. But, the reality is junk removal Minnetonka and junk disposal can be a big part of our recycling efforts if done correctly. Even in today’s electronic world, paper clutter persists. Our mailboxes overflow with coupons, advertisements, and bills. Sometimes, we dutifully bring piles of paper from the office to review. Not to mention, our children give us drawings and scribbles we can’t bear to toss. Do you ever feel like you are drowning in piles of paper? Welcome to the world of the paper monsters! During our chaotic times, it can feel like the paper is poised to take over every surface, with a good chunk of our sanity. Since stacks of unsorted papers add stress, you have to come up with a systematic plan to eradicate paper before it takes more of our energy and time. Here are some tips to help you tackle the piles of paper taking over your space. When organizing paper, your goal should be easy retrieval. After all, if you could not find a file, you might as well not have it. If you are not throwing away anything, your cabinet will overflow, and you will waste time trying to find every thing. If you want to avoid huge piles of paper on your desk, make it a habit of going through the paper stack at least once in a week. Start at the top of the file and sort out each piece. Scan your important documents like medical files, tax returns, insurance papers, and other files. Also, save any special photos or sentimental cards and then recycle everything else. Any unwanted documents that have your personal information like name, address, SSN or bank account number should be shredded. Do not toss out with regular recycling. Unsubscribe from the magazines that you are no longer interested in. Do you know recycling out Sunday newspapers alone would save 500,000 trees every week? Yes, if you dispose of it efficiently by hiring junk removal service Minnetonka MN. 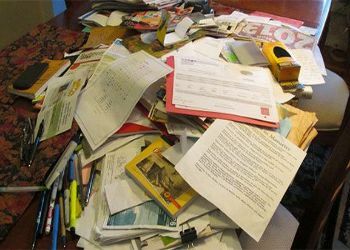 Once you sort out all the papers, toss everything into the recycling bin. Even if you bring some advertisements or coupons or flyers into the house, put them in the recycling bin.